** MIMIMUM NIGHTS vary depending on season. See "more details" at the bottom (please note that our min. differs from the ones shown under rates ). THE MOOSEHEAD CABIN is the perfect place to get-away with friends and family. Nestled on the north shore of a beautiful, quiet lake, with 10 private acres of surrounding meadows, forests, wetlands and beautiful views, you will feel like you are at your own private resort—yet it's only a short 90 minute drive from Seattle. Our clean, comfortable, and luxurious home has everything you need for a relaxing and fun get-away. Whether you spend your time inside, or outside, everything is here! The outdoor hot tub is just steps from the front door and open year round. 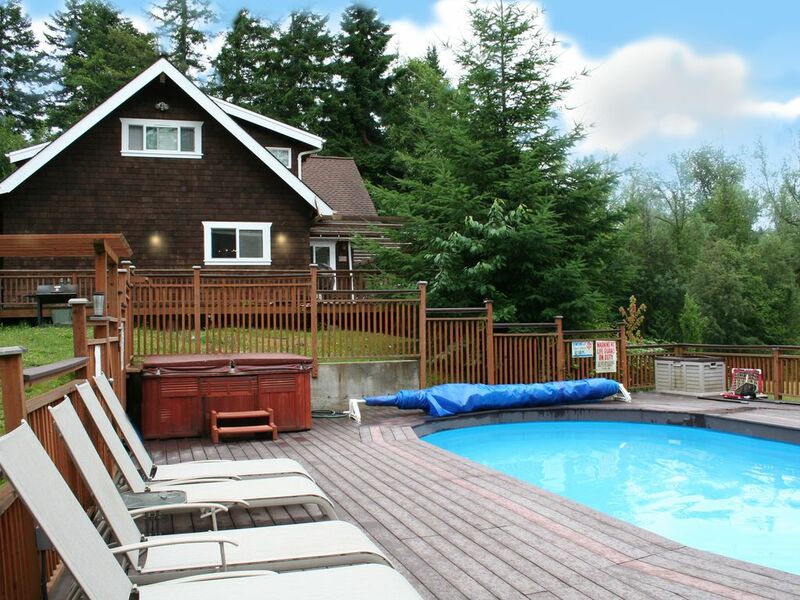 The heated pool is open from May to September. A spacious wrap-around deck is the perfect place to watch the eagles sore over the lake, or enjoy outdoor dining at a table that seats up to 12 people. A short path through the trees leads to a private 60' dock, with a rowboat, kayaks and a canoe for guests to enjoy on the lake....or bring your own motor boat or jet ski to enjoy on a lake that is never busy! The kids will have fun on the play structure, at the full size volley ball net, or playing catch in the meadow. At night, gather around the outdoor fire-pit next to the lake for smores under the stars—or on cold days, gather in the great room, with a roaring fire in the giant stone fireplace (under the moose) to play games, watch a movie, or read a book. Plenty of all 3 are provided. Up the road 1/4 mile is one of Washington's best kept secrets—Penrose State Park—with wonderful salt water beaches on Puget Sound, and easy hiking trails through the woods, with spectacular views of Mt. Rainier at the end of the trail. Lakebay Marina is also down the road, and is the 'happening place' during the summer with beer tastings, ice cream, and paddle board rentals. It's also a great way to visit by boat, and short term moorage is available. Come discover a little slice of paradise at THE MOOSEHEAD CABIN. -- Summers--4 night min unless unavailable (then min 2 nights). (Memorial Day weekend through Labor Day weekend). Friday and Saturday nights must be booked together (weekends). Priority is given to longer requests. No discounts during summer, but discounts may be available for longer stays during the low season (Sept. through May) excluding holidays. ** Please note that there is a MAX of 8 ADULTS, (up to 12 guests with kids) AT ALL TIMES on the property (including day visits). PLEASE DO NOT REQUEST LARGER GROUPS, as this is based on the size/capacity of our septic system and other factors. Hello from The Schellings. Our family of 5 enjoys traveling and lots of activities. Since we have 3 boys, spending time outdoors is a MUST. That's why we love spending time at the Moosehead! We built The Moosehead Cabin 2000. We wanted a place we could get to easily from Seattle (less than 2 hours), and had lots of space for our boys to run. We also wanted to be on a lake where we could enjoy activities like water skiing, fishing, and canoeing. When we stumbled on on Bay Lake, we knew we had found the place. Steve was nicknamed 'moose' throughout his school years, so we thought it would be fun to build a mini-lodge with a moose as the centerpiece. And so it began. The Moosehead Cabin has been a labor of love, and we enjoy every minute we're there. We hope you do to. Close to Seattle. Lots of privacy. Lake allows motorized boats. Great Southern exposure with lots of sun. Good restaurants and shopping in charming Gig Harbor. PRIVACY!! When we looked at other 'destination' places, most of the houses were all close together. We love the fact that no one sees us on our property, and we feel like we're miles away...yet really not at all! Bay Lake is a small, quiet and secluded lake, with a public boat launch, that allows motorized boats including jet skiis. There is very little activity on the lake, even on weekends! Fishing allowed. Home is 200' from lake, and completely private, with unobstructed and spectacular views, and no other homes around. 1200' of private lakefront, including a private dock. Most of the shoreline is protected wetlands. No air-conditioning, but lots of ceiling and window fans. It is usually not an issue as we get strong breezes off the lake. Great room with large screen TV, stereo, lots of games, movie DVDs provided. Two large leather sofas, 2 side chairs, game table, lighting, big windows with lots of light and views of the lake. One large oven (stove/oven combo). Drip coffee and Kuerig pod machines. Though we don't technically provide pantry items, many guests leave remaining spices, sugar, salt/pepper, etc. in the pantry for future guest use. Enough silverware and dishes for 12 guests, including wine glasses, serving platters, mixing bowls, etc. Large table seats 12 guests easily. A few baskets of toys for younger kids. Lots of open meadow area for playing catch. Row boat. You can bring your own motor boat or jet ski and use our dock to tie up. Public boat launch close-by. Large deck overlooking views of lake, with dining tables that seat up to 12. Life jackets including small children's sizes are by dock. Private, seasonal pool, is open from mid-May to the end of September. Open year round, and just outside the front door. Seven private acres, and over 800 feet of natural shoreline. Located on a protected wetland, we have a lot of wildlife, including deer, eagles, and many varieties of birds. We even have beavers on the lake. Great getaway for quite. This is a comfortable home. Lots of amenities. It’s an amazing property. Wonderful, relaxing stay for our book club. Loved the quiet and well appointed cabin. We arrived on a Friday evening for our annual book club weekend. We loved most the hot tub and the fact we were well off the main road for quiet solitude. We are a small group that have been coming back to the cabin every year for the past 6 years. This is honestly something we look forward to every year. Every amenity you could think of is looked after. The hot tub is great, the beds are comfortable, and the view is to die for. My family enjoyed pool, and sauna playing games enjoyed everything about. see you next year. Amazing property! Great for our families! Everything was so fun. Pool and hot tub was used constantly. Kids had a great time fishing. Home was stocked very well. The only thing we would have liked better is the bedrooms upstairs to be made into 4 instead of two so adults didn’t have to sleep with the little ones. Other than that we had a wonderful time! Glad to hear you had a great time. I'm trying to figure out what you mean about the bedrooms being made into 4....do you mean add another bedroom? Well, it is a 3-bedroom house, and not much we can do about that! We do provide as many beds as will fit in each room, including being able to turn two twin beds in the "bunk room" into a king as needed, which makes the rooms very versatile with lots of sleeping options. Kiddos can sleep in their parent's rooms, but if you want parents and kids to all sleep in different rooms, you might need a bigger house next time! But I suggest you study the bed configurations carefully to see if it works for your particular family needs. We come back each year as a family and always have a fantastic time. So much to do. My grandkids loved the pool. All learned to swim at Moosehead. Great cabin with lots to do. Enjoy 10 acres of privacy and activities. The TV never turned on. There were too many things to do. Reserve early for the summer months. I have already booked next year it has now become our yearly retreat. Ten private acres on BAY LAKE. Best of both, freshwater (lake) and salt water beaches up the road at PENROSE STATE PARK. • Responsible adult (who signs rental agreement) must be at least 25 and on the property during the rental period. • Max of 8 adults, and up to 12 including kids, at ALL TIMES on the property. • Friday and Saturday nights must be booked together. • A credit card is required for damage deposit. • 4pm check in, noon check out Weekend rates apply for all holidays. Minimum number of nights for holidays vary. Please inquire.